Oklahoma City is the state of Oklahoma’s largest city and also the eight largest city in the United States by land area. The city is known for its modern metropolitan flair with a low cost of living, as well as its industries of livestock, oil, and gas. It is also home to Tinker Air Force Base, the U.S. Department of Transportation Mike Moroney Aeronautical Center, and several colleges and universities. 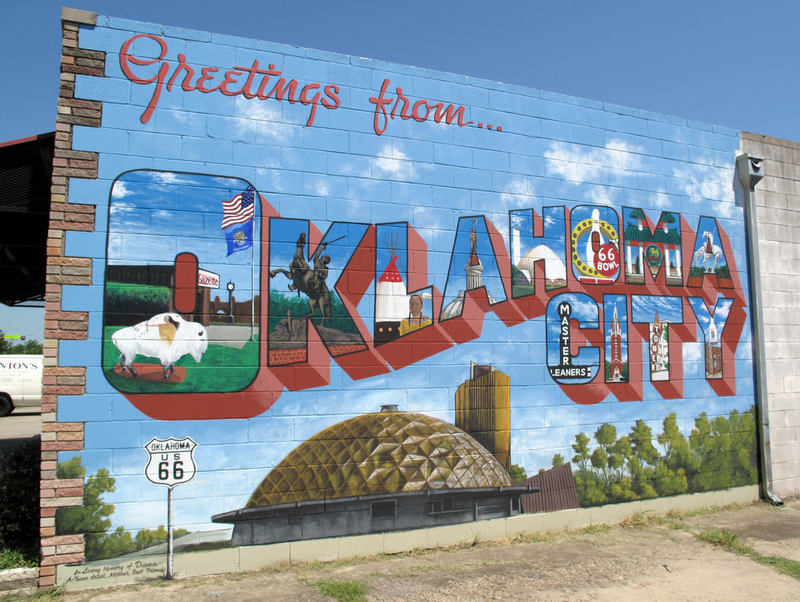 Oklahoma has been honored as one of the best cities to move to. Other recognitions include Oklahoma City as one of the most affordable places to live, one of the best places for military retirees, and even one of the best baseball cities. As an oil and gas hot spot, the Oklahoma housing market is seeing the effects of low oil prices. While the average home sale price has dropped over the past year, they are still well above 2014 prices. The market is still showing other healthy signs as well, including a drop in the number of days homes are available on the market. As the market continues to boast affordable homes and stability from Tinker Air Force Base and Boeing Aerospace, Oklahoma City remains a good place to buy or sell a home. In fact, Oklahoma City was recently named the best city for first time home buyers. While the Oklahoma City housing market remains healthy today, that could change tomorrow. Whether you’re buying, selling, or investing in Oklahoma City, it’s a wise move to work with a qualified, experienced Realtor who can help you navigate the city’s market and make the best decision for your future. We’ve highlighted the 15 best real estate agents working in Oklahoma City today. These agents are experienced, trustworthy, and well appreciated by their clients. They are experts in their field and are prepared to take on any challenge in the Oklahoma City real estate market. Each of these real estate agents is excellent, so we haven’t listed them in any particular order. But we would like to know which one is the best. Please vote in our poll at the end of this article to let us know which Oklahoma City real estate agent has your vote. But don’t wait: the poll closes in 30 days! Melissa Dana specializes in helping buyers, including first time home buyers, relocations, upgrades, and buyers scaling back. But her team manages every aspect of real estate including single family, multifamily, investment property, commercial property, even rental management, land purchases, and mineral rights. Dana promises to give every client the time and attention they deserve, listening to their needs and wants. Each client is given all of the resources necessary to make an informed, confident decision. Clients say Dana is always attentive and helpful, and never seems to get tired of their requests for help. They find that she is genuinely interested in their needs and makes them feel like friends, not clients. Paula Thurman is an Oklahoma native and broker associate with 14 years of experience in real estate. She has a background working in the property management industry and is a valuable asset for both residential and commercial properties. Sellers enjoy diligent service with comprehensive marketing, negotiating, and monitoring, while buyers appreciate Thurman’s extensive knowledge of Oklahoma’s real estate market. Clients say Thurman is a true professional, courteous and thorough in all aspects of real estate and customer service. They point to her patience, persistence, and excellent communication as particular strengths. Josh Barnett is managing broker of Oklahoma Real Estate Crew. He has more than nine years of real estate experience. Barnett and his team help individual companies buy and sell real estate in the Oklahoma City area, including homes, land, commercial property, and oil and gas mineral rights. They’ve closed more than $106 million in real estate sales in the last nine years. Clients appreciate Barnett’s ability to help them make well informed decisions and his extensive efforts as they buy, sell, and invest in Oklahoma City real estate. Brandon Hart is an Oklahoma native and experienced broker with the Hart Home Selling Team. He has been working in real estate for more than 13 years. Hart has been recognized as a multi million dollar producer for many years and remains a successful real estate agent. He is passionate about placing a high priority on clients, and is proud to call many of his clients friends. As leader of the Hart Home Selling Team since 2003, Hart has taken a team approach to real estate and provides his team with the support needed to successfully satisfy every client. Clients say he is an excellent Realtor, delivering great results and taking care of every detail even when they aren’t able to be there. They feel he helps them get the best real estate deals possible and appreciate his knowledgeable and organized approach. Aubrey Roberts is a nationwide top producer and Oklahoma City metropolitan expert. With more than 30 years of experience in both real estate and real estate finance, Roberts is a highly qualified and experienced real estate agent serving the Oklahoma City metropolitan area. He is ranked in the top six percent of Realtors nationally by the National Association of Realtors, and holds a number of certifications and designations including Accredited Buyers Representative, E-Pro, Resort and Second Home Property Specialist, Military Relocation Professional, Short Sales and Foreclosure Resource, and Seller Representative Specialist. Roberts’ clients say he is friendly, upfront, and honest, making their priorities his priorities. They find him easy to reach and always ready with a response. Karen Blevins is leader of the Karen Blevins Group, one of Edmond’s fastest growing real estate groups. She has more than 19 years of experience in real estate and works in practically every Edmond and Oklahoma City neighborhood. Blevins and her team are experts in Oklahoma real estate. They demystify the marketplace, make every search easier, and provide the best value for every client. Blevins has been consistently recognized as a top producer and has won many recognitions including 2014 Edmond Realtor of the Year. She also served as the president of the Edmond Board of Realtors in 2014. Blevings holds the Certified Residential Specialist designation and is a graduate of the Realtor Institute. Clients of Blevins say she and her team are always on top of every aspect of the process. They feel she does a great job representing them with excellent suggestions and proactive communication. Kathleen Forrest is owner and broker of Metro Brokers of Oklahoma. She is proud to put her clients first as an Oklahoma real estate professional. Her client first philosophy depends on making herself accessible, responding quickly to client needs, and being a good listener as well as a good communicator. Forrest’s in depth knowledge of the Oklahoma City community and market, effective negotiation skills, excellent network, marketing savvy, and integrity are just part of what makes her an excellent real estate agent. Clients say she makes the process easy with a knowledgeable, resourceful, and compassionate team. She makes them feel like a priority, always answering questions, phone calls, and emails promptly. Since 1977, Becky Ivins has been a real estate professional. Now with more than 37 years of experience, she is one of the best Realtors in the Oklahoma City area. She specializes as a buyer’s agent and listing agent with interests in relocation, consulting, and property management. Special areas of interest for Ivins are senior real estate and military relocations. She holds designations as a Seniors Real Estate Specialist as well as a Military Relocation Professional and enjoys transitioning seniors from their homes as well as helping military families buy or sell in Oklahoma City. Ivins has her own live radio talk show on KTOK every Saturday morning. Clients of Ivins say she makes every experience pleasant. They appreciate her professionalism, expertise, and knowledge — as well as her ability to deliver excellent results. Paula Peeler is managing broker of Kalidy Realty with more than 25 years of experience in real estate. She is a consistent top producer and has long been recognized as an asset in the Oklahoma City real estate market. Peeler uses her experience, education and high level of energy and enthusiasm to satisfy her clients. She enjoys an excellent referral base, and most of her clients are either repeats or referrals thanks to her excellent relationships with clients. Peeler is proud to price, market, and aggressively negotiate homes and show properties to her clients. Her clients say she delivers a wonderful experience. They recognize her as knowledgeable and instrumental to the process of buying or selling a home in Oklahoma City. Team leader of The Tom Hall Group with Keller Williams Elite Realty in Oklahoma City, Tom Hall has more than 11 years of experience in real estate. He is an Oklahoma native and is well versed in serving local buyers and sellers as well as those interested in relocating and and out of Oklahoma. Hall specializes in expired listings and places a high importance on excellent photos and informative listings to attract buyers. As a full time Realtor, he enjoys helping sellers obtain the best sales price and move on to their next home. Clients appreciate Hall’s patience, availability, and thorough service. They find him to be very knowledgeable and always available to answer questions. Simon Shingleton is a licensed Realtor with more than 16 years of experience. He specializes as a buyer’s agent and listing agent with interests in relocation and consulting. Shingleton has been involved in all aspects of the real estate sales and development process, including home building for custom and speculative building. He places an emphasis on exceptional customer service and is passionate about helping clients make informed real estate decisions. Shingleton holds the GREEN real estate designation. Clients say he is a take charge Realtor and represents the best of his profession. They find him to be extremely professional, trustworthy, and always happy to go out of his way to meet the needs of his clients. Beth Atkinson is a top producing Realtor with more than nine years of experience in real estate. She specializes as a buyer’s agent and listing agent with interests in relocation and as a community pillar. Along with her team, she is an advocate for her clients. Atkinson is proud to help her clients make an informed decision about one of the biggest choices families will make in their lives. Clients call her highly professional, pleasant, and knowledgeable. They appreciate her quick responses and willingness to go above and beyond to help with the sales and purchase process. Monica Schultz is a Realtor with more than 11 years of experience. She also has a background in finance, serving as a CFO for several small companies. Schultz is known as The Internet Marketing Queen due to her extensive online marketing strategies. She is dedicated to getting the best exposure for her clients, selling their homes quickly and helping buyers find a great home. Clients say Schultz is genuine and matter of fact, and they never doubt that she has their best interests in mind. They enjoy her excellent communication, expert price setting and staging, and remarkable ability to make sure every detail is handled. Craig Ahrens is a broker associate with Dean Lemons & Associates. He has more than 12 years of experience in real estate as well as 13 years in retail sales and management. Ahrens emphasizes his role as an educator and communicator. He loves meeting and helping people, as well as working the numbers in real estate and successfully completing real estate adventures for his clients. Ahrens is always there for his customers every step of the way and takes great satisfaction in knowing that they’re happy with the real estate choices he’s helped them make. Clients of Ahrens say he is friendly, knowledgeable, patient, and always flexible. They find him to be very helpful and educational, providing them with plenty of insight into what to look for and how to make the right choices. A native of Oklahoma City, Wendy Chong has more than 19 years of experience in real estate. Her native status gives her valuable real estate knowledge and a unique insight into the market and neighborhoods of Oklahoma City. Chong has a number of recognitions for her achievements in real estate, including multiple years as the #1 RE/MAX individual sales associate in Oklahoma. She received the RE/MAX Lifetime Achievement Award in 2012. She continues to enjoy selling real estate and takes pride in providing her clients with a high level of quality service. Clients say she knows the market and is always honest and forthright in every detail. They point to her constant support with prompt responses and thorough information as particular strengths.